I'm supposed to be helping a friend of mine update her website and organize it better. So far I've taken pictures of some of her products, looked at a few templates we could possibly use, and done some research. Some of that research involves looking at other similar sites to see how they're organized. She sells uncured natural meats and Alaskan salmon, so I've been checking out this website where you can seafood order online, and I forgot about the organization and started looking at the pictures. 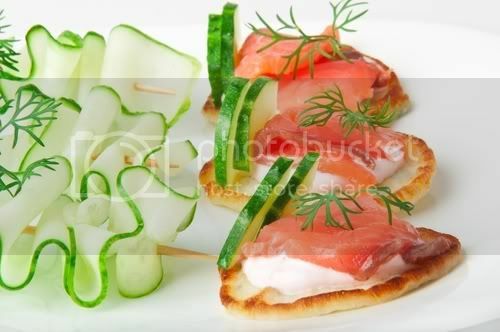 Do you see how good that smoked salmon looks in that picture? I am going to have to figure out how to take better pictures of the products - pictures that people just can't resist. The pictures on this site certainly have me wanting to add some of these things to my cart - the Smoked Salmon, Sockeye Salmon Maple BBQ Kebobs, and the Sockeye Salmon Burger with Ginger Dill to name just a few. I'll have to keep looking at these pictures and hopefully find some online information about food design and photography. Any suggestions for that? I have a hard enough time getting decent pictures for my recipe blog. Half the time my problem is that I don't think to take a picture until after we've eaten the food, so at least that problem is solved, since the whole point will be the pictures. Maybe getting to eat the food afterwards would just be a bonus!